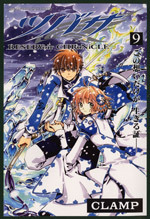 The covers of the usual and deluxe versions of TRC #9 are now available! Yuuko is so damn great! That outfit is absulutely great and I can’t wait to see the whole image! Do you have any thoughts of who will feature the next one? I’ll bet on Clow! 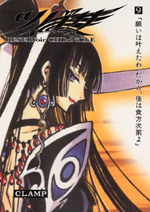 The image featuring in the usually edition is the same one that was featured on Shonen Magazine #1. This is the “bad” thing about having tsubasa featuring the front cover -___- But now we can see it entirely and sure is beautiful. I had no idea that the background was this icy-thing… I wonder if they’ll visit a world like this? I hope so, the costumes are amazing! Both editions comes out on February 16th! You can now download DN Page 53 on flowright! This surely is one of the best chapters EVER! And NOW I understand everything! I mean, I knew that once you touch the note, you do remember everything. And I didn’t get why Misa couldn’t remember a thing! Of course, because that was not her note! So Raito changed the Notes and the one that is buried belongs to Misa! That’s why she couldn’t remember, because it was not her note ^__^ As for Raito, well, he could remember everything since it’s his note. Misa as Kana or Kana as Misa?